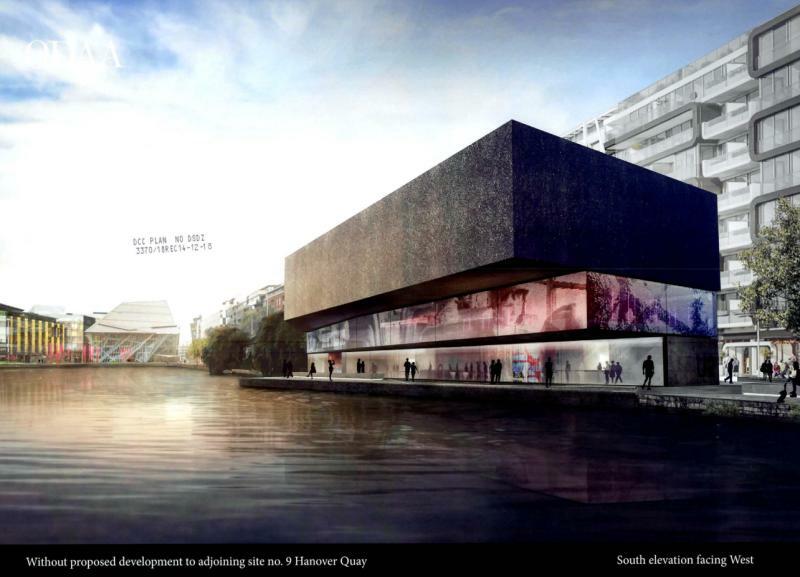 It was announced today that U2 have gotten permission to develop the area they currently use in Hanover Quay as a studio, into a new exhibition centre. There have been certain conditions that will have to be met to go forward with the design including payments to the Planning Authority, a donation to the development of the LUAS line in that area, as well as conditions relating to the design, and safety of the facility. If U2 chooses to proceed with these conditions met, the plans would see the current building torn down, and replaced with a four floor space, one of which will be below ground. To get the permission finalized, the overall initial design had to be reduced by 2.34 metres. This reduction in height has come through redesign of elements of the design, a reduction in the height of some of the internal rooms, as well as changes made to the allowances made for mechanical and electrical services. 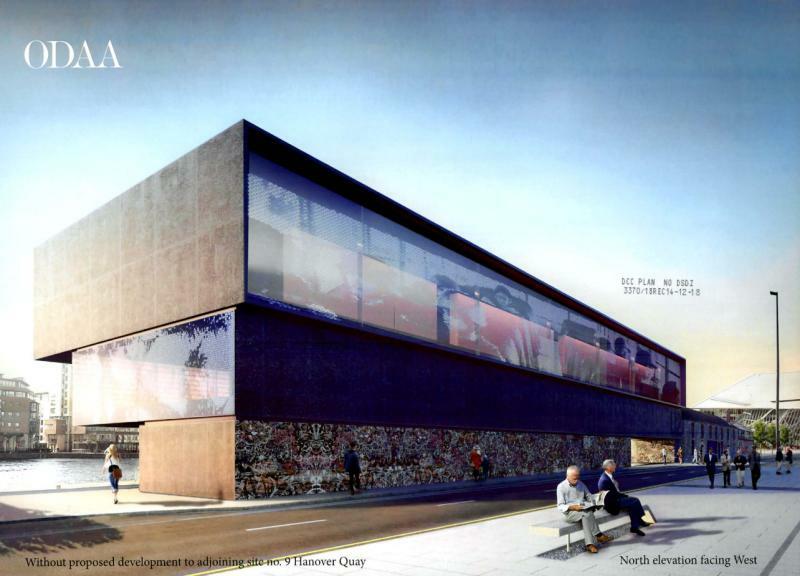 As part of the new design, new CGI generated images showing the outside of the proposed facility have been produced by ODAA (O’Donoghue & Associates Architects). These images are a stark contrast to the original CGI images which showed the building on a dark dreary day, showing the centre in a bright well lit day. The structure will overhang the canal, and a floating walkway will be constructed behind the building, to allow one to walk along the waterside of the building, an area which cannot currently be accessed. One will enter on the ground level, which designs show will retain some form of graffiti element, which is known to cover the location today. The second and third levels (being called the 1st and 2nd floors) of the building will be constructed with large glass elements which further lighten the structure. The images shown, include an image of children on a school bus with army helmets on, taken from U2’s recent eXPERIENCE + iNNOCENCE tour displayed during the song “One”. It appears that this is not a video display, but rather some sort of light reducing treatment on windows on the upper level on one side (North) and will be a digital display on two other sides (South and East). The night view of the building by ODAA shows the entrance to the facility, and shows these images lit up. In the report these are referred to as “static imprinted & patterned flixed glazing to North Elevation” and “Fixed glazing with Integrated LED Digital Display to South and East elevations”. The basement would be below ground, and would include amenities for the staff of the complex, including bicycle storage, staff showers and washrooms. It would also include a private archive area, and storage which would not be accessible to the public. There would also be a public archive, and good news merchandise fans, looks like this area will also offer a merchandise area, where you’ll be able to buy a reminder of the experience when you visit. The public washrooms for the facility will also be located in this area. The ground floor will be where one enters the exhibition, and this area will also have a separate entrance to an office and administrative area on the floor above. There will be a small cafe located in this area, as well as a small food preparation area for the cafe. On the public side of the ground floor there will be reception area, ticketing area, and several displays, as well as a view down to the archives below. There will be displays in this area as well, and diagrams sent to city council include several areas where four mannequins can be seen standing, possibly a display of costumes as people enter and move through the space. The office itself is located on the first floor and will include several offices, a reception area for the office, a kitchenette for employees, and washrooms for the office staff. On the public side of the first floor there will be several displays including LED screens, an archive display, and mention of a control room / sound desk, which is not located in the final diagram. 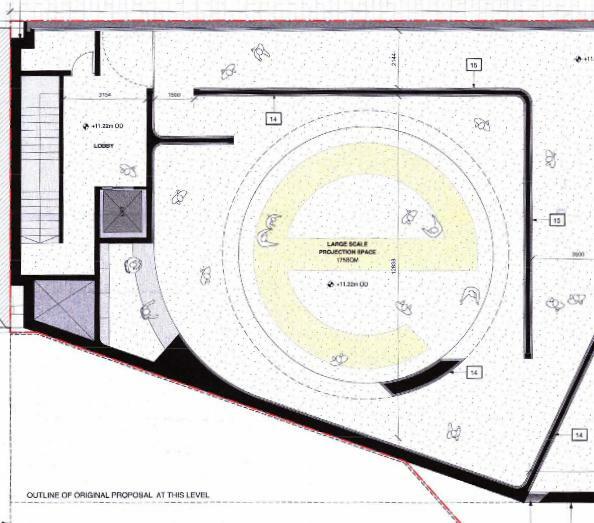 Images provided to City Council include a drum kit and other instruments, a “Vertigo” concentric circles enclosed area, and another “Vertigo” area where it looks as if a drum kit has been set up. 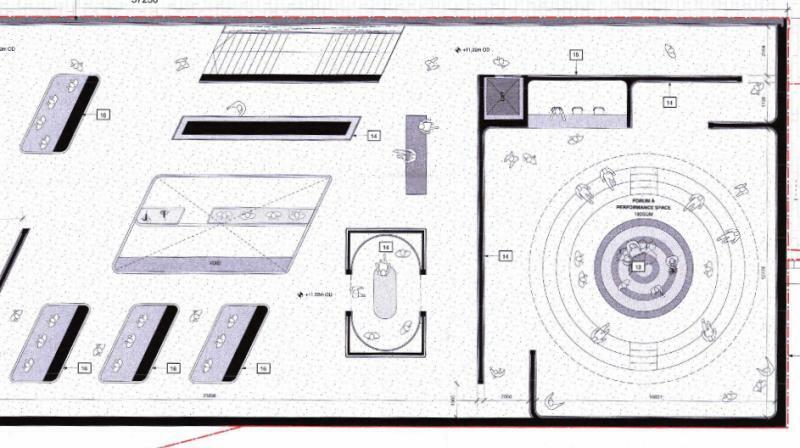 The other end of this floor has another of those “Vertigo” target patterns, and what appears to be a desk like area, perhaps the mentioned control room and mixing board? This area is fully enclosed, and it is possible that this area could be used for performances, or even recording if a working mixing desk is installed. The second floor will be a larger open space, and it appears the full area will be open to the public, including a large projection space, displays throughout, and what is being described as a forum and performance space. Of note on this level is the large scale projection space is designed with a yellow “e” on the floor. Could this possibly be a final resting place for the e-Stage from the current tour? 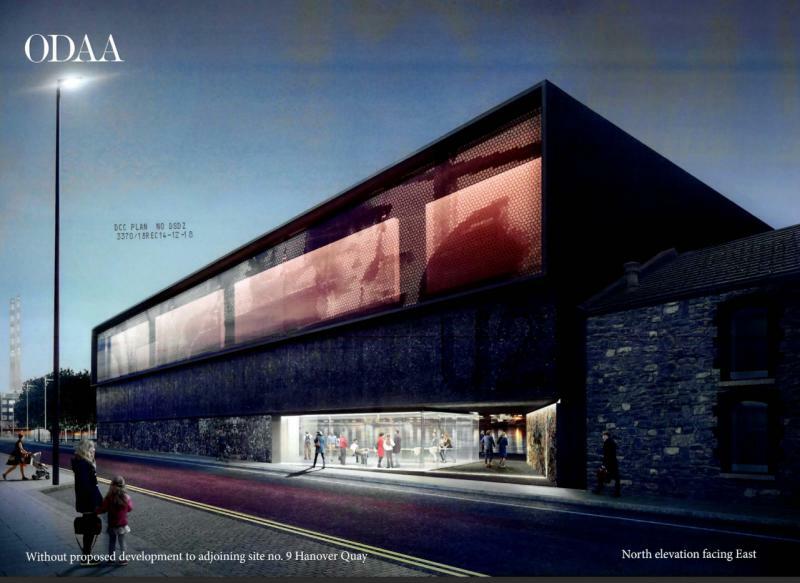 The planning report looks at the expected traffic to the facility, and they expect that the facility will draw 390,000 each year, which is on par with other paid attractions in Dublin such as Dublin Castle. An expected peak day would be 3000 visitors, but they would expect a more reasonable 2500 per day during busy months. The planning report suggests that the average visitor will spend between 40 minutes and 80 minutes in the exhibit, with additional time being spent in the cafe and shops area. Compared to other musical exhibits the report references two exhibits at the Victoria and Albert Museum, each of which ran for five months. In five months a Pink Floyd exhibit there brought in 360,000 visitors. And in a similar time frame a Bowie exhibit brought in 312,000 visitors. The exhibit will be a ticketed admission. Ticket prices were not discussed, but purchase of tickets were. Tickets would be offered for a time slot such as 12-12:15. You could buy a ticket in advance to enter at that time. This is done to spread traffic to the site throughout the day, and a discount may be offered if buying in advance in this manner. Ticketing will also be available if just turning up on site. No timelines on the construction of this new piece of U2’s history have been given, nor has any timeline for the opening of the Exhibition been discussed. But we will be watching this development carefully, and will let you know as things progress and any dates are revealed. The planning documents can be seen at the Dublin City Council website. The documents shown above come out of the December 2018 submission made after reducing the height of the building.